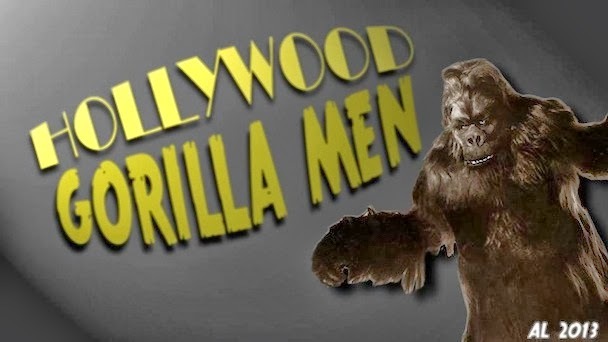 Hollywood Gorilla Men: BRING ME THE HEAD OF WHITE PONGO! BRING ME THE HEAD OF WHITE PONGO! 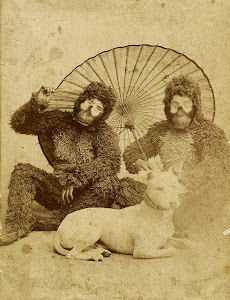 Perhaps even more fascinating than the images of Gorilla Men in their natural Hollywood habitats, are the rare shots of their suits sans inhabitant. Long before the micronization of animatronics, the underlying architecture of dynamic costumes were damn near medieval. Back in 2004 Heritage Auction House sold a head mechanism that was purportedly from one of my favourite suits, White Pongo, worn by cowboy Ray 'Crash' Corrigan. How comfortable could that hunk of iron be as you sweated your rump off inside all that fur, cooking under the Klieg lights? Unfortunately, I came upon the archived listing for the mechanism - it sold for a paltry $300 (I woulda coughed up for that price!). Inflation can move fast - it was listed on Ebay recently for over $2000 (if memory serves!). Below the apparatus is a glorious still of Ray menacing the lovely damsel of WHITE PONGO, Maris Wrixon. Revisiting old material from Gorilla Men has me rummaging about the net for anything else that may surfaced in the interim since the original post. Below is what I believe to be description from the Heritage auction - identifying the source of the artifact as Uncle Forry's basements. 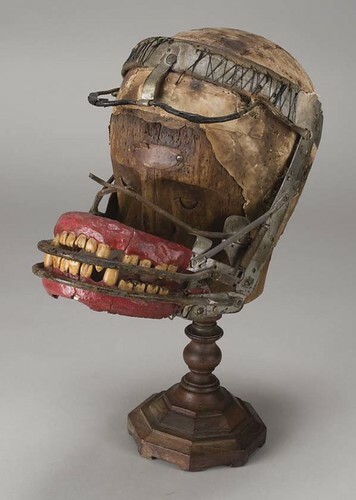 Figures..
Head mechanism used inside of the gorilla costume from "White Pongo", P.R.C. Pictures, 1945. 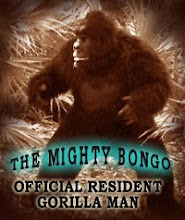 Worn in the film by gorilla impersonator Ray "Crash" Corrigan. 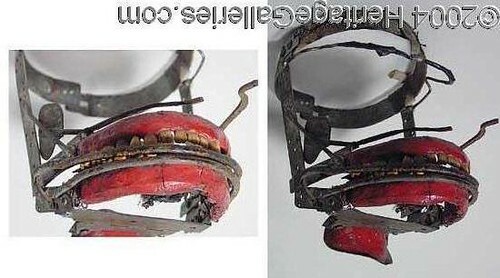 The mechanism consists of a head band and sidebars attached to a jawpiece. The jawpiece has realistic-looking gums and teeth affixed. Above and below the teeth are wires that move independently of the mouth, which would allow an overlaying gorilla mask to "snarl". 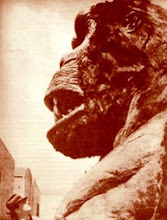 There are two small plates that rest on the side of the actors face, when manipulated they move wires that apparently made the gorilla's nose "snort". Metal and wood composition, measures 9 inches high. FROM THE COLLECTION OF FORREST J ACKERMAN. CONDITION: Minor rust marks.